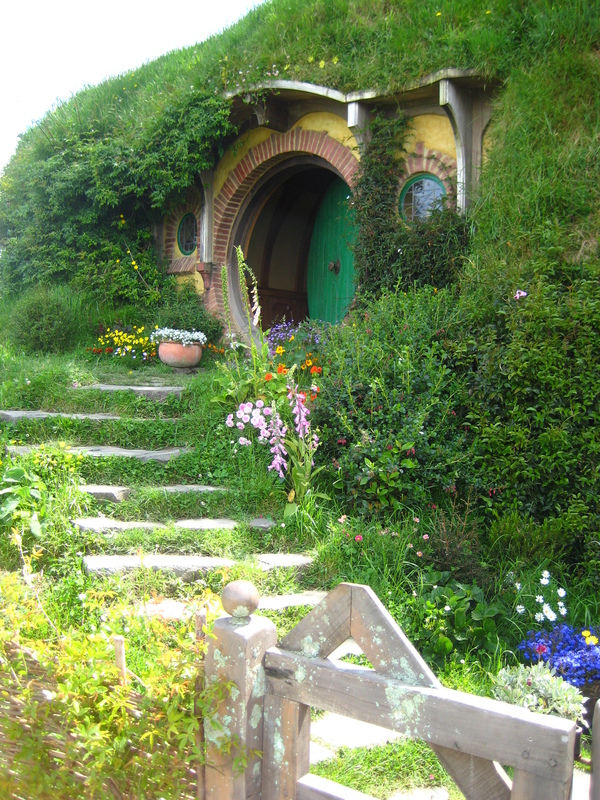 This post is long overdue, as it’s been nearly 2 months since my trip to beautiful New Zealand for the premiere of The Hobbit. Writing about my Richard Armitage encounter was a lot harder than I ever thought it would be, and I’ve gained a new appreciation for you bloggers that manage to do this on a regular basis. I don’t consider myself a great writer and can tend to be a bit wordy, but I hope you’ll find these ramblings a little entertaining anyway. As I headed to New Zealand for The Hobbit Premiere festivities, I never truly expected I would actually meet the man himself. Wellington was bound to be packed with visitors and the chances of running into him anywhere seemed pretty impossible. I’d only seen Red Carpet events in pictures or videos, but most seem to be more about the press than the fans, so I wasn’t sure how close we would be able to get to Richard Armitage. I had high hopes of seeing him on the Red Carpet and taking a few quick snaps as he walked by. I even thought maybe, if we were really, really lucky we might even get a quick hello with an autograph, but I tried hard not to set my hopes too high. 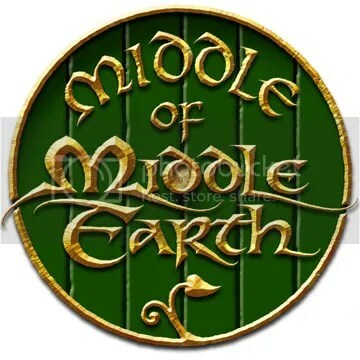 So there I was, on a packed Air New Zealand flight about to be bound for Middle-earth itself. Although I was excited, I’d been traveling for much of the day, and by the time I’d reached LAX, I was beginning to feel the weariness that airport travel brings. I wanted to be ready to hit the ground running once I reached New Zealand, and I hoped to get some rest on my flight to Auckland. As I settled into my seat, I could hear the flight crew making some announcements. Over the PA, a flight attendant said something about duty-free merchandise still needing picked up and began going through a list of names……. Wait…WHAT!? Did she just say what I think she said? No way! Not possible, I told myself. I figured maybe someone was having a laugh, maybe another RA fan on the way to New Zealand even. After all, why would Richard Armitage be on a flight from LA? He’d be coming from London, wouldn’t he? I managed to mostly brush it off, and settled in for my 11 hour flight to Auckland. There was plenty of Middle-earth entertainment to keep me occupied and our lovely AirNZ Concierge gal even had a Hobbit trivia contest. A few hours into the flight, as dinner service was beginning, I overheard something that nearly stopped my heart. The flight crew were serving meals to the people in the row in front of me, and the flight attendant asked if they’d started their journey on the London leg of the flight. Thankfully Air New Zealand serves complimentary wine with dinner because, at that point, I needed something to calm my poor nerves. I tried to brush it off again as best I could. After dinner, Concierge gal announced that if anyone was interested in The Hobbit to contact her (via this really awesome instant message type system, so cool!) and she might stop by their seat with some goodies. Hobbity goodies!? Yes please! :) So I typed a cheeky message about how she should come see me because I was headed all the way to Wellington for the premiere “…and to meet Richard Armitage,” I added. The curiosity was killing me, and I figured this might be my only hope of finding anything out. About half an hour later Concierge gal did stop by my seat. She brought me some lovely goodies, and an astonishing revelation…..
“He’s up there isn’t he? !” I nearly squealed, pointing toward the front of the plane. Oh crapola! It suddenly occurred to me, I just might! Well you can imagine how the rest of the flight was for me. Trapped on an airplane knowing that Richard Armitage was merely a few meters/yards away, breathing the same recycled airplane air, it was almost too much. My mind was running wild, but I also knew that being at the far back of the plane (row 58, middle seat) there was very little I could do to investigate without potentially reenacting the scene from Bridesmaids in the First Class Cabin, and probably getting myself detained & deported from New Zealand upon arrival. I wasn’t ready to jeopardize my entire trip just yet. Finally, we landed and are getting ready to deplane. I resisted the urge to shove my way through scores of lovely people in order to get off. As I said before, I’m at the very back of the plane, and it starts to sink in that my chances of seeing our man are getting smaller by the minute. Still, as I finally hit the terminal and head towards passport control, my eyes are peeled for any sign of the lovely Mr. Armitage. The passport area at Auckland is much like any other except that, to me it seemed rather dark, as if only half of the lights were on. I was trying desperately to get my paperwork in order while still scanning the room for a glimpse of RA. Where on earth could he be? Everyone goes through passport control, even TDH Brits. Could he have gotten through that quickly? Oh no! This can’t happen! I can’t get this close and then not even see him! I was so shell-shocked and sleep deprived, I thought I just might cry…. Wait….THERE!! It’s him! Holy moly! It’s dark and he’s on the complete opposite side of the room (VIP lane of course), but that profile is unmistakable. Oh yeah, it’s Richard Armitage. At this point it was nearly impossible to breathe or maintain any focus on what I was doing. I still had to make it through the passport check, and I was trying to watch my line, but mostly just gawking at Richard and trying desperately to remain in a vertical position. He was wearing boots, a dark jacket, and carrying a backpack. I noticed there was most definitely something stubbly on his chin (squeeeee!) and that he was chatting away with an adorable little blonde (who we later discovered was most likely his lovely publicist, Ruth Bernstein). I took my eyes off of him for a split second and discovered it was my turn at the window. Handing the lady my passport, I make my best attempt to appear calm and rational. This attempt was smashed to bits as I see Richard walk past, directly behind the passport control booth that I was standing in front of. I’m not sure I can describe the myriad of emotions that hit me at that moment, but judging by the look the immigration lady gave me as she handed back my passport, they were written all over my face. Passport in hand, I bolted forward into the walkway and spotted Richard a few meters ahead of me. It took a lot of willpower and restraint not to burst into a full run down the corridor, but I did however break into a bit of a speed walk/jog. It didn’t seem too out-of-place to be in a hurry in an airport, and I wanted to bridge as much distance as I could before we reached the escalator that was just ahead. My quick stepping landed me only 5 or 6 steps above RA on the escalator, giving me a perfect view of his lovely head. I stared intently as he continued chatting away with the cute blonde. They reached the bottom of the escalator and disappear to the left, into the baggage claim area. I followed close behind, trying not to lose sight of the man for too long. I stopped quickly, as I discovered he has stopped just a few feet ahead of me. His back was to me, and I realized he had just stopped in front of the rest of his traveling group. I stood there wide-eyed and mouth gaping, as I spot Martin Freeman…then Andy Serkis….Elijah Wood….and even little Kiran Shah all standing with Richard Armitage, less than 10 feet in front of me. WHAAAAA!! Holy Moly! I stood there dumbstruck, for what seemed like days. I was completely frozen in my spot. Martin, who was facing me, was wearing sunglasses and chatting with Kiran, while Elijah and Andy seemed to be politely conversing with a couple of fans. I noticed Richard and the cute blonde began walking over to the other side of the bag carousel, presumably to be in a better position to grab their bags. There was a group of women standing off to the side of where MF, AS, and EW were standing (more publicists) that appeared to be traveling with them. After a few moments, cute blond walked over to chat with these ladies leaving RA standing on his own….. I realized I’ve been handed a once in a lifetime opportunity! He’s by himself, so if I’m going to talk to him this was the time to do it. Oh my gosh! This was it! It was now or never! I went to New Zealand in the hopes of meeting Richard…and there he was! I knew it would likely be awkward and uncomfortable, but I owed it to myself and every RA admirer I know, not to let this chance pass. I desperately mustered every bit of courage I had, took a deep breath, and walked as calmly as I could toward where he was standing. He was standing right next to a pillar, so I had to walk around behind him to get to where he was. I didn’t know how else to get his attention so I reached up and placed my hand on his left shoulder-blade and said his name. (so bold, I know but, yes friends, I touched the leather!!) As he turned to look at me, I nearly lost the power of speech, and I could feel my body shaking. I apologized for bothering him and said that I was a “fan” of his work and he thanked me, genuinely, and gave me such a sweet smile. It was during his thank you that I remember us making eye contact and, let me tell you this, no photo can capture what it was like to look into those eyes. I don’t remember exactly what was said after that because, well, I was horribly nervous and in a sleep deprived, over caffeinated delirium. I mentioned that I was meeting up with some other fans for the premiere, and he chuckled and said it was going to be an amazing week. He asked how my flight was (sweet man), and I jabbered about the turbulence that made it hard to sleep, and he chuckled about being so sound asleep that he didn’t notice anything. At this point he turned toward the luggage cart in front of him and (here’s where it got REALLY awkward) started fidgeting with a shopping bag (that mystery Duty Free purchase?) and said something about having trouble with his bag [getting it to stay in the cart?]. It was a strange transition, and I decided to take that as my cue to go before I made a nuisance of myself. I said I didn’t want to keep him any longer and just wanted to say hello. He didn’t look at me or say anything but just kept fidgeting with the shopping bag. It was odd, but it didn’t feel rude or anything. I got the sense that maybe he was a bit nervous too (he kept chuckling and saying “yeah”), as well as being groggy from such a long day of travel. I backed a few feet away from him, and there we stood, waiting for our luggage. His bags (2 large suitcases) came round well before mine, and I watched as he and the others pushed their carts into the next checkpoint area and disappeared. There was no sign of them by the time I got my bags, and I presumed, at this point, that they were all long gone. As it turns out, I would see them all again, and again, and again. (My poor nerves!) After a coffee and chat with the lovely Anna, who met me at the airport (and a bit of fanning ourselves as well), I boarded a flight to Wellington only to watch RA and the rest of the group board the same plane too. Trapped on an airplane once again. At least this time I could see the back of the man’s head. As I looked toward the front of the plane, I could see dozens of Bilbos staring back at me from the cover of the AirNZ magazine. I wondered what it must be like for Martin to be sitting a few rows ahead and seeing the same thing. I wondered if he and RA had begun to realize the craziness that awaited them over the next weeks to come. They were just leaving the baggage claim in Wellington by the time I reached the terminal, so I only saw RA walking away. I gathered my bags and headed off to find my shuttle. There was a bit of walkway between the exit and the baggage area and I came upon the group again as I looked for the exit. As I passed the group, I could see in my peripheral vision that Elijah Wood started walking just behind me. I was trying to muster the courage to say hello when he came across someone he knew and stopped to chat. How many are still recovering from last night’s drunken stupor of fangirling? So while you’re not love bombing RA’s charities, go over and tell Glamour what you think. 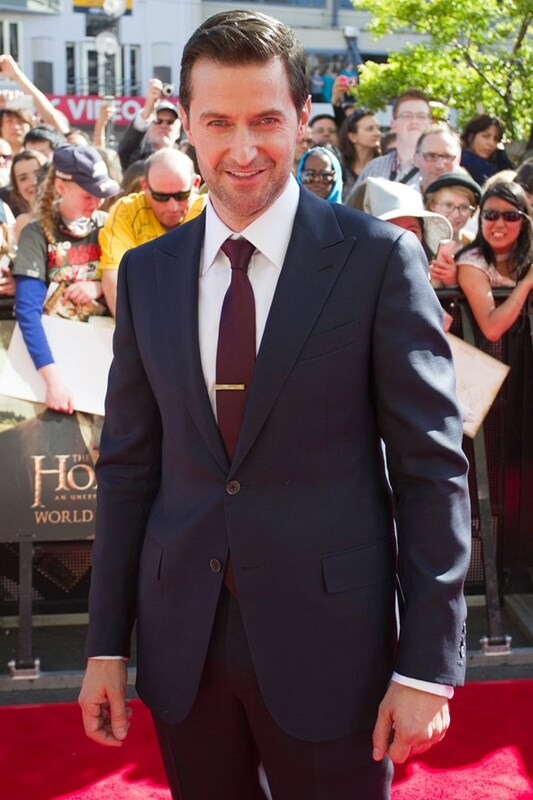 Also, I’m thankful to Ilaria Urbinati for her lovely work in dressing Richard Armitage. Damn! How do people get these jobs?! Should have been a stylist! Only one problem. I am short on knowing how to create a style. I just know what I like when I see it. Don Draper eat your heart out! Thanks to Ali at RichardArmitageNet.Com for the heads up. Yes! You can watch The Hobbit Premiere live and get your fix of Richard Armitage even if you’re not in New Zealand and don’t have a cable connection. Doesn’t matter. There are places around the web which will offer live, free streaming of the event. The Red Carpet will begin at 4:30pm Wellington Time with streaming coverage beginning at 3:50pm. If you’re not sure when that is your time, you can check out this clock. I’m currently looking for other sites and will add as I find them and correct links as needed. Additionally, if you find some, please feel free to let me know, and I’ll update. Also, please note that some of these streams will offer replays as soon as the event is done, so no worries if you can’t watch it live. 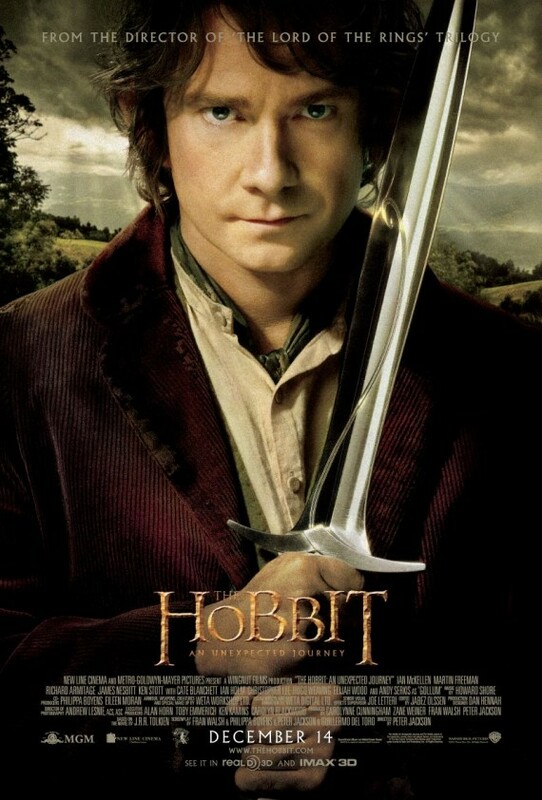 Do You Really Want to Go to New Zealand to See The Hobbit? What are you waiting for?! Sign up for Air New Zealand’s contest to win a chance for a fantastic trip. Seeing The Hobbit is only part of it!! You know my hatred for certain kinds of punctuation. Would I be using this many exclamation points if I weren’t serious about this?!! You only have a little while longer to enter. 6pm on Sunday 11th November 2012 NZ Time is the deadline, and that is, well, I don’t know how many hours that is from now, but it’s not long. I’m utterly serious that they are nuts. Larry Curtis (aka MrCere at TORn) despite his beautiful baritone voice is definitely a nut. Cliff? Oh yeah. :D And I say all of this with the greatest affection. They fit right in with this place. (note to self: I need to write about these two some more). Yep, we’re getting all sorts of details about the shindig the Kiwis are planning for The Hobbit premiere. They’re even renaming the town for the event. Okay, okay, okay! I admit it! I would love to go to Wellington! There I said it. Phew. I can’t stand it. I’ve got to stop thinking about this, or I’m going to have a meltdown. Yeah, yeah, I said I wasn’t going to watch the Royal Wedding either. I was so glued to the set and had no good excuse for it. I’m blaming this foolishness on Tolkien. I should have been a travel agent after I finished my career as a make-up artist. note: I did publish something erroneously right before this post. Sorry, but it’s not ready yet. note: I’m posting this for all of you who are still not on Twitter. The video below was taken at Ian McKellen’s one man show which has been raising funds for Christchurch’s earthquake-damaged Isaac Theatre Royal. Once again, RA is almost hidden. Watch how he moves to the back. Some of that is conditioning from being tall. I have a daughter who is 5’8″ and a dancer. She was always up stage unless featured as I would bet he was. But he has long since left dancing and the stage. Hmmm. For a long time I have believed his humility was part real and part effected, but I’m beginning to believe that he really is a bit shy. Considerate of fans but shy when not performing. Edit: shy is not the best word; reticent is more apropos. My son is a performer, and at the risk of sounding biased (when has that ever stopped me), he is very good. He’s been known to draw crowds from 50 miles around. Might not sound like much, but it’s big deal in our parts. SO and I have continually encouraged him to also hone his public speaking skills, and he has resisted. 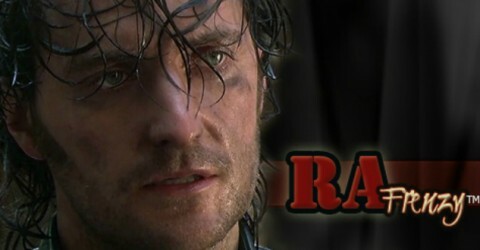 Thanks again to RichardArmitageNet.com for the heads up and all the great work you do!